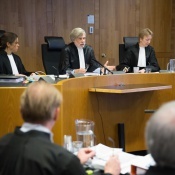 24 June 2015 | A Dutch court today ruled that the country’s government failed to protect human rights by not implementing policies that would reduce greenhouse-gas emissions by at least 25% by 2020. “Based on the State’s current policy, the Netherlands will achieve a reduction of 17% at most in 2020, which is below the norm of 25% to 40% for developed countries deemed necessary in climate science and international climate policy,” the court said in the official English translation of its decision, available online here. In a test of human rights tort law, the three-judge panel sided with the Urgenda Foundation, which filed the lawsuit on behalf of 866 citizens who accused the government of negligence for “knowingly contributing” to policies that would send global temperatures spiraling upward and flood the low-lying country. Urgenda had argued that the country was obligated to meet minimum requirements to protect its citizens, and it had the support of several signatories to the Oslo Principles, which were formulated in March by legal experts and high-court justices from around the world – including the Netherlands and the United States. A similar case is underway in neighboring Belgium.